I’m sure you have been wondering why I haven’t been mentioned on the blog for a while. (You were wondering, right?) Well, I have been really busy for the past few months taking a Junior Showman class through the AKC – American Kennel Club! This means that I learned how to be a dog handler at a dog show. A friend of the family is a professional dog handler and I traveled with her to Philadelphia to see the National Dog Show firsthand! It is a really exciting and stressful time for both dogs and handlers. The National Dog Show is a benched show, which means the dogs need to wait patiently on platforms so visitors can see the dogs firsthand when they are not competing. It’s so hard for the dogs to not do what comes naturally! I was lucky that I was able to show a dog as a junior. 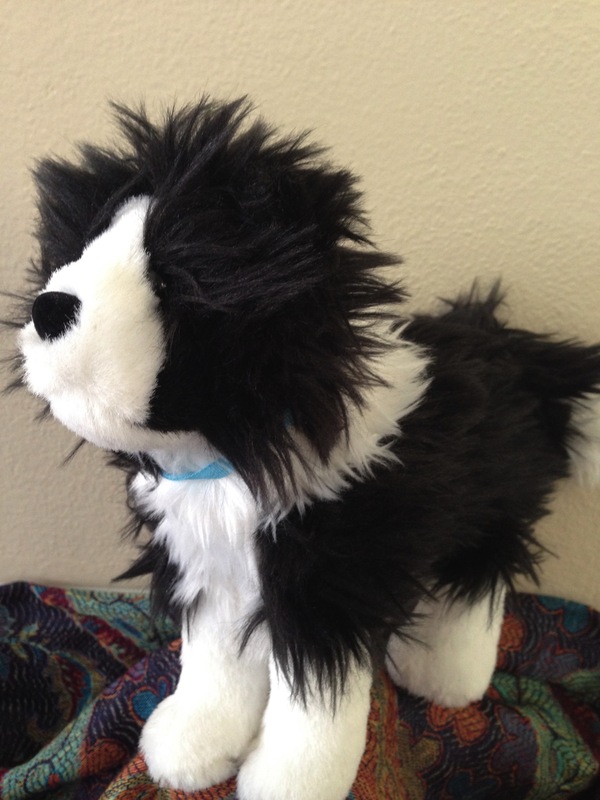 I had been practicing for weeks with Rembrandt, our friend’s Border Collie. Rembrandt competed in the Herding class of dogs. Walking in a straight line did not come naturally for my show pup – he would much prefer to round up all of the handlers and dogs and drive them right into the middle of the show ring! We were quite a sight – It is super hard to not get tangled in the leash while trying to remember which side of your body the dog needs to be on after you turn. We didn’t make the cut in the herding category, but it was so much fun. After the competition, Rembrandt got his picture taken by a professional photographer. He is a champion to me! 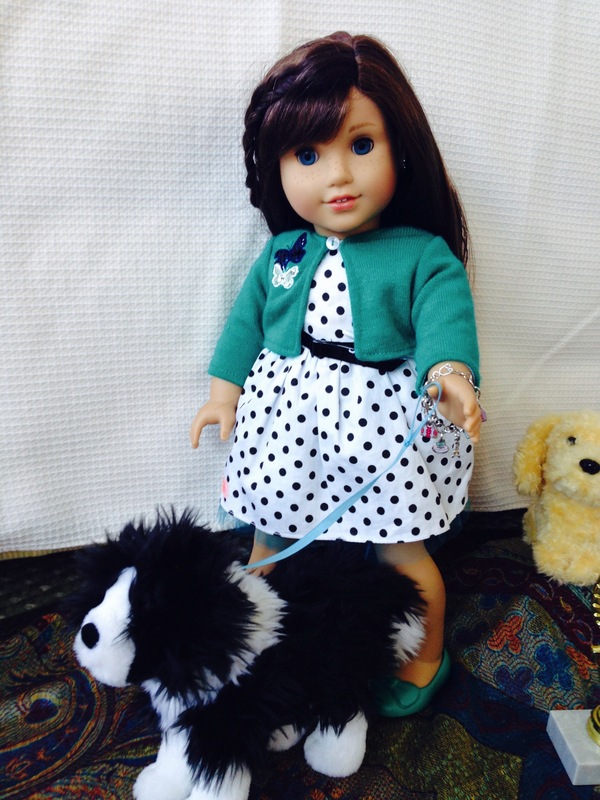 This entry was posted in Fiction, Grace and tagged AKC, American Girl, National Dog Show on November 29, 2015 by Jen. 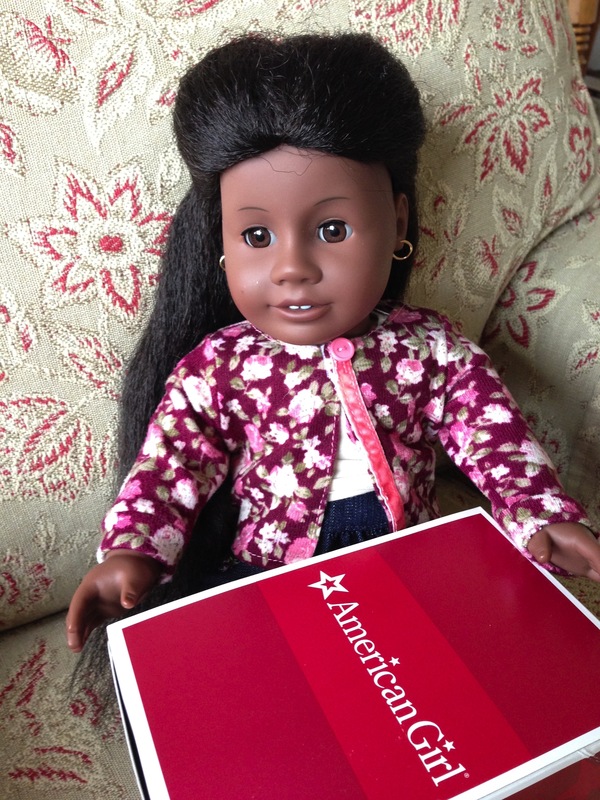 American Girl Sale… Could Be Trouble! Happy Thanksgiving friends! 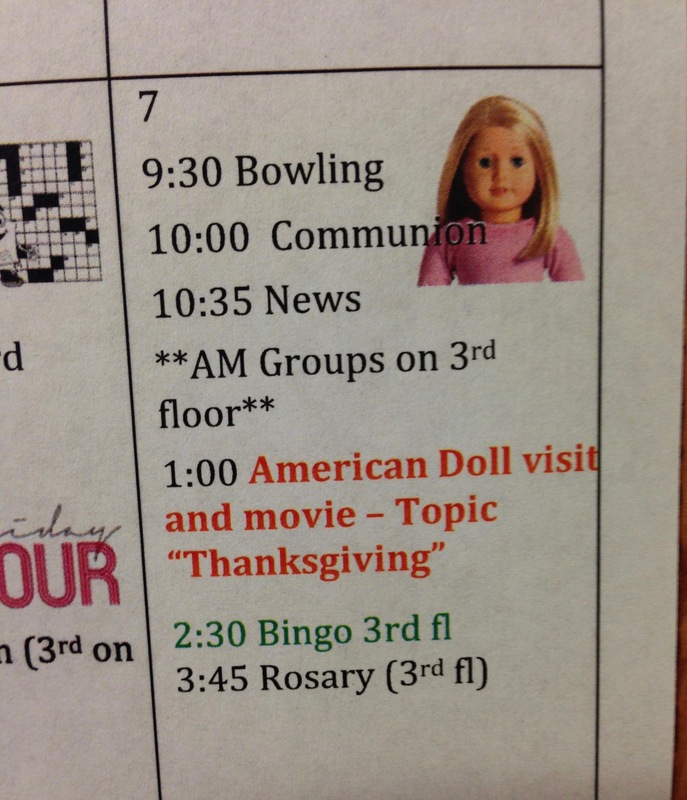 I am grateful to have pals like you in my life that share my love for dolls. This is hard to come by when you are long past second grade! I’m sitting in my chair in pjs taking a walk through the big AG Holiday catalog. That 20% off sale is pretty appealing. I wish I could meet you for a peppermint mocha today and talk over this sale! 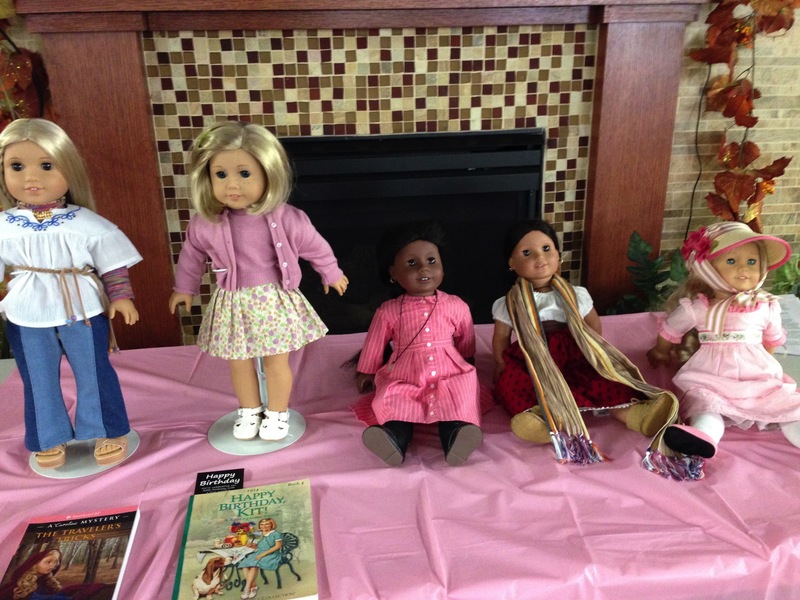 20% off a doll puts you in the ballpark of prices at the Madison Doll Sale (historicals). As much as I love the craziness of the Madison sale, I am glad others have an opportunity to partake of discounts. Any dolls tempting you? Fess up now! I’m feeling a bit of a push to prioritize Addy items if it comes to pass that Addy retires when “Melody” arrives. Addy is still my most special doll and she doesn’t even have her own bed! Another area on my mind is outfitting the now infamous doll in the closet. In other developments, have you seen the new Barbie commercial? I think Mattel did a great job with it. A girl shows up in a big college lecture hall saying “I’m your professor today” and later it is revealed that she is pretending to be many different things through her dolls. A+! This entry was posted in Uncategorized and tagged American Girl, black friday on November 27, 2015 by Jen. This reporter found the story in short order. The older girls knew that meet outfits could only mean one thing — we were going on a road trip to share our stories with senior citizens in Assisted Living! This was my first time joining the doll presentation, and little did I know I would be the star of the show! The ladies loved my sweater twinset and pleated skirt. Can I tell you a secret? I saw one person look at Caroline’s underwear! That made me blush a little. After Jen and Brianna spoke, we all watched my movie and had popcorn! Many of the ladies remembered cars like the ones my Dad sold, and the songs and furnishings in the movie brought back lots of memories. We piled back in our big container and drove home, a little exhausted from so much love. We hit the road again in January; until then we will try to not misplace our shoes and stockings! This entry was posted in Kit, Senior Outreach and tagged American Girl, Assisted Living on November 8, 2015 by Jen.